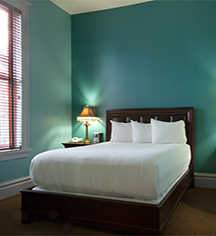 After an exciting day exploring downtown Spokane, retreat to this intimate boutique hotel to relax and recharge. The 36 beautifully appointed guestrooms and suites are updated to include all the conveniences for the contemporary business and leisure traveler. 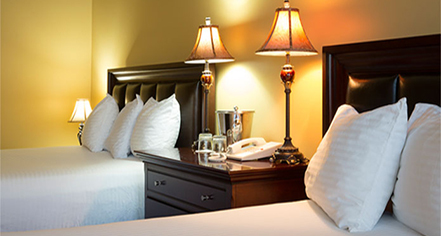 Housekeeping is provided daily and all guestrooms and suites are non-smoking. The spaciously open guestrooms, located on the second and third floor, offer high ceilings and large windows with charming city views. With plush premium bedding and private baths featuring designer toiletries, a hair dryer, and a makeup/shaving mirror, it’s easy to unwind and feel right at home at the Montvale. Standard Queen features a luxurious queen-size bed and can accommodate up to two adults. Standard Queen-Euro features a spacious European shower, luxurious queen-size bed, and can accommodate up to two adults. Standard Double Queen features two queen-size beds and can accommodate up to five adults. Standard King features a luxurious king-size bed and can accommodate up to three adults. Deluxe King features a jetted tub for a relaxing soak, luxurious king-size bed and can accommodate up to three adults. The Queen Parlor Suite is a favored choice of families and small groups. The suite features a luxurious queen-size bed with plush, premium bedding and a queen-size Murphy bed for extra sleeping space, with French doors dividing the two separate sleeping areas. The private bath features designer toiletries, a hair dryer, and a makeup/shaving mirror. Enjoy a cup of coffee or glass of bubbly in the cozy sitting area while taking in the city view. The suite includes a microwave and refrigerator and can accommodate up to five adults. The Dwight D. Eisenhower Presidential Suite is the largest guestroom at 600 square feet and perfect for those looking to indulge. French doors lead to an adjoining room with a king-size bed in premium bedding. The private bath features a jetted tub, designer toiletries, plush bathrobe, hair dryer, and makeup/shaving mirror. Relax in front of the fireplace in the elegant sitting area, featuring a sofa and table with chairs. Open and airy with windows galore, guests can delight in Spokane’s downtown city views. The suite includes a microwave and refrigerator and can accommodate up to three adults.